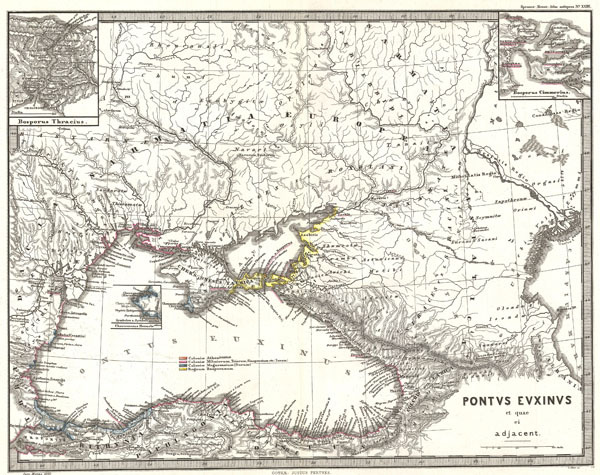 This is Karl von Spruner's 1865 map of the Black Sea and adjacent regions (Pontus Euxinus et quae ei Adjacent). This detailed map focuses on the Black Sea and the area immediately surrounding it, including what is modern day Ukraine, the southern-most portion of Russia, and northern Turkey. Spruner also includes two detailed insets of Thrace (Thracia) and the Crimea (Cimmerius.) Thrace is a historical and geographical region in Southeast Europe. The areas it comprises are southeastern Bulgaria (Northern Thrace), northeastern Greece (Western Thrace), and the European part of Turkey (Eastern Thrace). Crimea is a peninsular region north of the Caucasus and the Black Sea attached to modern day Ukraine. The map shows important cities, rivers, mountain ranges and other minor topographical detail. Countries and territories are designated with colored borders and each map includes a key or legend. The whole is rendered in finely engraved detail exhibiting throughout the fine craftsmanship of the Perthes firm. Rumsey 1626.024. Phillips (atlases) 3288. Espenhorst, J., Petermann's Planet, p. 397-404. Espenhorst, J., Andree, Stieler, Meyer & Co., p. 148.